It took us 11 hours driving time from Thimphu to Taktse. We did take a detour to go to a college ceremony in the Panakha Valley a few hours east of Thimphu, but much of the road itself was arduous, something like an obstacle course. There were long patches of deep, rocky ruts and narrow, muddy passages with huge boulders scattered throughout the road. Many places were only one lane with two-lane traffic and people passing on the curves. 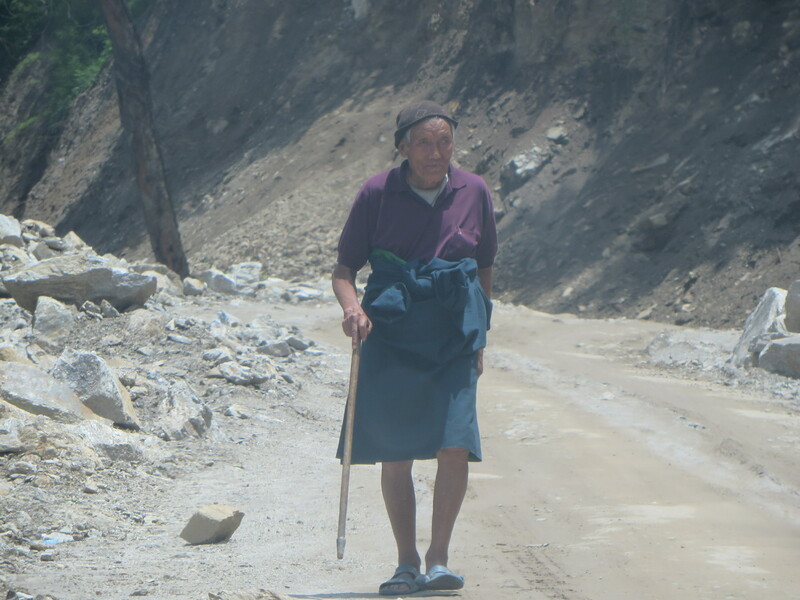 The condition of the road was compromised by the fact that it is being widened by chopping vertical slices out of the mountains, but there were also places of recent mudslides. Mercifully, we travelled on a day when there was no work being done; otherwise we would have encountered roadblocks that could have required several hours wait. We arrived in Taktse about 8:30 at night, so it wasn’t until morning that the splendor of the place revealed itself. Mists and clouds drifting through mountains and moments of pristine blue sky alternate. The locals say there are four seasons in every day. Classes begin on Wednesday, and I am entrenched in preparations. Thick clouds blanketed our crossing of the Himalayas, so it wasn’t until our plane gently swooped into position for the landing that a panorama of lush green and misty wisps of cloud took my breath away. Houses sit amidst terraced gardens of rice and vegetables. All is quiet but for the drizzle of rain on shallow puddles. Bhutan at last — towering forested slopes in the clouds. Helga, Jude and I trundle off to a guesthouse on the Royal University of Bhutan — Paro campus. A window opens to the rushing river. We go off in search of dinner and find red rice, chilies, and a cilantro chicken. In the middle of the main street, a group of about 8 cows had decided to bed down for the night oblivious to the cars navigating around them. I am so tired after 3 days of travel, I am tempted to join them. Forty-five minutes of switchbacks and roller-coaster roads east of Paro is Thimphu, the densest urban concentration of the country. Every building is a work of art, painted with Buddhist symbols, geometric figures, animals, or — in a few cases –penises (https://en.wikipedia.org/wiki/Phallus_paintings_in_Bhutan). Nearly all people wear the traditional garb of gho (wrapped knee-length jackets) for men and kira (long, wrapped skits) for women. I am required to dress similarly while teaching, so we spend entire afternoons going from one fabric shop to another to buy the hand-woven lengths of material for the skirt and coordinating fabric for the jacket (tago) and its lining (wanju). The decisions are exhausting as there are hundreds of patterns to choose from and finding color and pattern schemes that seem harmonious are mathematically staggering. At last, we are laden with bags of material and head to the tailor’s shop where we beg to have the garments sewn quickly before we leave the city on Sunday. Through the rain, we drive about the city from one administrative office to another securing visas, work permits, telephone numbers, bank accounts, and duty free cards (which allow expats to buy alcohol from the duty free store). Many, many hours are passed waiting for forms to be processed, required documents to be procured, and signatures to be scribbled. The city is a quiet one, but for the myriad songs of birds. Sidewalks are full of bustling pedestrians. Flowers and trees proliferate. The city seems more of a busy park than a metropolis. Tobacco is illegal, so there is no one smoking. The air is delicious. At Tripoli airport at last on my way to NYC for Christmas with my kids. The process of acquiring the visa for getting out of Libya took nearly four months and it wasn’t until two days before my flight that all the paper work was in order. Other foreigners were not so lucky; one young man – newly wed to a girl in India – had to fork out 750 USD to get a rush (probably illegal) visa to visit her in the hospital where she is quite ill. Another guy is having to reschedule his flight to London hoping that he will have his visa in a couple of days. I am giddy with a sense of relief at being able to get out of the confinement of the school compound. There have been moments when I believed once out, I would not return, but I am sure I will be back after my week’s respite. I wonder if this is a case of Stockholm syndrome. The commitment to those kids is overpowering, and my colleagues are the best bunch I have ever worked with. They are from all over – Jordan, Syria, Egypt, Pakistan, Canada, the U.K., and a couple of us from the U.S. All have a good deal of experience teaching internationally, and they are well-grounded individuals. The intensity of working under the conditions of chronic mismanagement, daily outages, mysterious emergencies, and essential restrictions have bonded us rather tightly. Our Libyan counterparts are quite wonderful as well; the panache with which they cope with their country’s staggering growing pains is quite phenomenal. So I will return from my R&R with little Statues of Liberty, I Love NY tee-shirts, Michael Jackson CDs, teacher planning and grading books, and as many kids’ books as will fit in my luggage as I promised. Plus all the hope I can muster. The lines of cars queuing up at petrol stations go on for miles while the ports are besieged by groups pressuring the government to acknowledge autonomy for eastern Libya, a region that includes the militias of Ben Ghazi where American teacher Ronnie Smith was gunned down on the street last week. The Libya Herald reports P.M. Zeidan saying that the ports will open tomorrow, but there are no details of a deal that would ensure that. Meanwhile, cars are abandoned on the streets, and there is growing tension about the situation. I have heard that contraband petrol can be had at over 100% increase in price from a few weeks ago. So tonight the explosions began about an hour ago — around 9.30 p.m.. After my bedroom windows rattled alarmingly, I went outside to ask our guards about it, and they were adamant that there is no threat to us living at the school. They say that people are stealing petrol from the station down the street. Mish mish kalha (no problem), they insist. Libya is hard to understand, they explain. They tell me to go to sleep and have pleasant dreams.